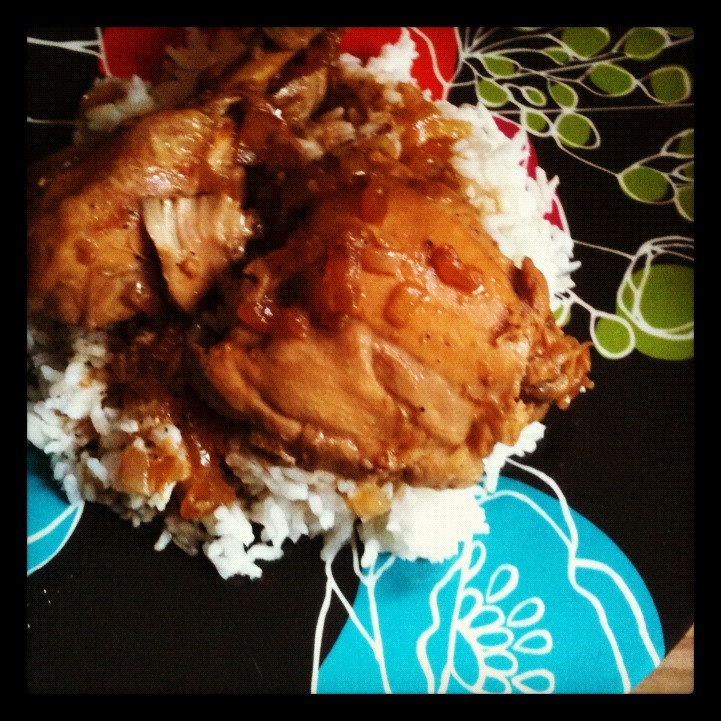 Hey everybody, here’s another installment of (Filipino) Dish a Month. And yes, color me guilty… I didn’t do it last month, and I won’t even begin to make promises of making it up by providing 2 Filipino recipes because I’m bad. **You’re also going to need a pot with a lid and a wok. You begin by prepping your chicken, remove as much skin as you can. I like to use a pair of kitchen scissors, it makes this task so much easier! Once that’s done toss all of your chicken into a large pot. Add the vinegar, soy sauce, and 5 cloves of garlic and pepper. I would usually generously cover the chicken with a layer of pepper… not too much, but you know what I mean… like 11-12 shakes. Cover the pot and let that cook at medium to low heat for about 30-45 minutes until the chicken is cooked. Your house, actually your whole neighborhood should be smelling really good right about now. When the chicken is nearly cooked, in your wok, heat up about 2 tablespoons of oil and your chopped onions and the remainder of your garlic. Once those are nice and tender add your chicken.. just the chicken not the sauce it’s been cooking in. Add the oystersauce to the chicken and mix well. Cook for about 5 minutes then add the sauce to the batch.. cook for an additional 5-10 minutes. Now this is the time if you would need to add more soy sauce, vinegar or pepper to suit your taste… I personally like my adobo a little sour so I’d add a little more vinegar… Let that simmer for a few more minutes. Serve with some freshly cooked rice and enjoy. Mmm. Also, I would suggest trying the leftovers for breakfast with rice and a fried egg… this is called adobsilog. Oh man, that’s some real good Filipino eats! Enjoy! And see? I told you it was simple.